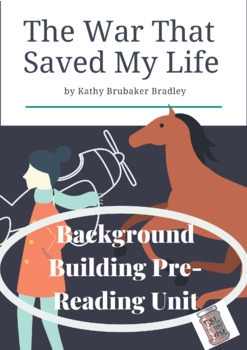 This background building unit is for the excellent novel, The War that Saved My Life by Kimberly Brubaker Bradley, suitable for 4th grade through 8th. It is intended for use before beginning to read the novel to build background. 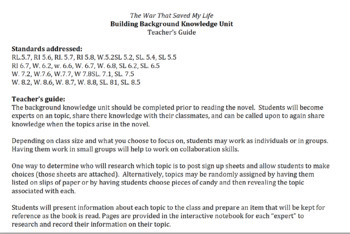 Students are either assigned or select a background topic and complete a project to "become the expert" on that topic. They keep that information throughout the reading of the novel and share with the class as needed or when relevant to the reading. 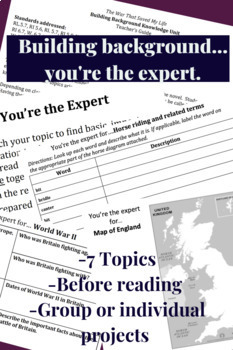 There are 7 topics included for students to choose from e.g. Britain during World War II, clubfoot, etc. This product can be used on its own, but it was designed for use with the Interactive Reader's Notebook for this novel, also in my store.